va-Q-tec is strengthening the company’s position as a leading provider of high tech insulation solutions in the industrial space. va-Q-tec already has a major customer portfolio in this field and is enabling them to reach the highest energy efficiency. There is great potential in the area because of the VIPs superior insulation performance. With maximum energy efficiency and optimum use of space va-Q-tec’s products are suitable for many different application areas in the industrial and technical industries. One of the newest applications is in the piping industry where va-Q-tec has developed innovative solution to insulate pipes with VIPs. For the first time va-Q-tec will be attending the ISH fair in Frankfurt from the 11th to the 15th of March. va-Q-tec experts will be showcasing products with VIPs specifically relevant for the technic and industrial industries such as insulation for hot water storage tanks and piping. The participation in the fair is another step to position the company as a pioneer in thermal insulation for technical applications. The ISH is the world’s leading trade fair for energy efficient solutions for management of water and energy in buildings. More than 2.500 exhibitors will attend with the newest innovative technologies and around 200.000 visitors are expected. 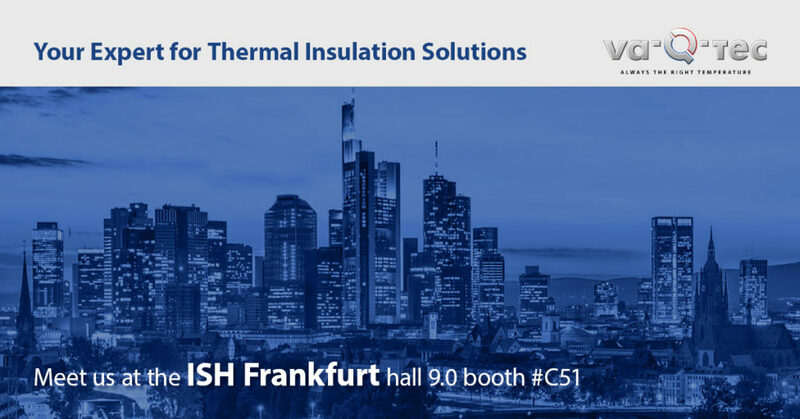 Come and see va-Q-tec’s experts at the ISH booth C51 Hall 9.0 from the 11th to the 15th of March 2019.